I have an event coming up called Business Blogging For Sales Lead Generation that will reveal how quick, easy and fun strategies can help you improve your Search Engine Optimisation (SEO) and acquire new leads for free by blogging. Here is an example using an Infographic. 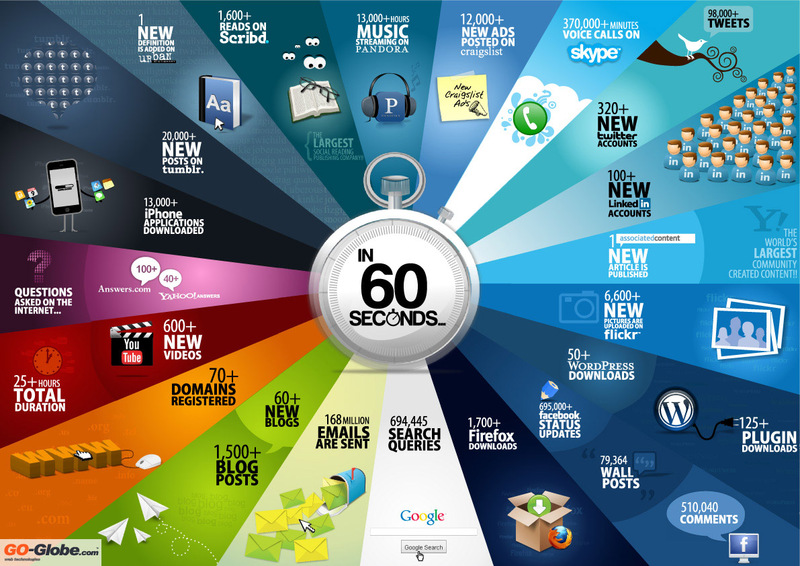 Karen Bonanno posted an interesting infographic (shown below) on what happens on the Internet in 60 seconds on her School Management Library Blog. This blog post alone has 6 embedded strategies to help Karen and me attract new sales leads. If you want to know what they are and how other business owners are leveraging their blogs to generate free sales leads, you’ll have to attend the Business Blogging For Sales Lead Generation event! Published on October 12, 2010 in Events, Internet Marketing, Lead Generation, Mistakes To Avoid, Social Networking and YouTube. 0 Comments Tags: Social Media Mistakes, Social Networking. At our upcoming (and last ever) Exponential Internet Marketing Bootcamp, we’re going to go well beyond explaining Social Networking as shown in the video below. We’re going to cover the risks and pitfalls of getting sucked into the Vortex Of Mediocrity where countless hours are wasted by people who fundamentally don’t have a life and therefore have no cash to spend. That being said it doesn’t mean it can’t be leveraged – it surely can, but not in the way the Internet Spruikers want you to think. Internet Spruikers want to sell you systems and solutions so they can make a fortune. What we do for our clients is cut through all the CR_ _ to uncover what works. Like the $25, 15-minute strategy that increased a jeweller’s web traffic by 25% within a week. These are real results for real brick and mortar businesses. The strategies are so good and easy to implement, that we now guarantee them… That’s right, when you become a VIP Bootcamp ticket holder, we GUARANTEE you’ll make at least $30,000 in the next 12 months. That’s putting our money where our mouth is. In November, we’re staging the last Exponential Internet Marketing Bootcamp in Melbourne. As I explained at my recent Exponential Extravaganza events, I am getting out of the “Internet Marketing” space letting the Internet spruikers and promoters do their thing at their multi-speaker salesfest events. That does not mean I’m abandoning Exponential Internet Marketing strategies, in fact for our Platinum Program Members, we’re even more aggressive with our strategies than ever before. It’s why we can and do GUARANTEE 300% RETURNS. The Bootcamp includes Pre Program Preparation™ as well as Post Program Planning™ to ensure you get the most out of the event – in fact we even GUARANTEE the results from the Bootcamp if you purchase a VIP Ticket! The video below explains what the Bootcamp Experience is like. Learn Exponential Internet Marketing Strategies that turn clicks into cash 24 hours/day 7 days/week. Wanna be an Internet Champion? Attend the Bootcamp – WE’LL GUARANTEE You’ll Make $30,000 in the next 12 months! Published on September 30, 2010 in Events, Exponential Mindset, Mistakes To Avoid, Social Networking and Strategy. 0 Comments Tags: Deep Knowledge, Google, Nicholas Carr, The Shallows. There is a great article on CNN’s website that summarises Nicholas Carr’s new book called “The Shallows: What the Internet is Doing to our Brains“. It reflects what I see in business people and entrepreneurs every day. People struggling to cope with more and more information, lacking the cognitive and reasoning skills to handle it. In this day and age, deep knowledge is increasingly important when technology and Internet allows us to be intellectually lazy and superficial. This is exacerbated with social networking where people spend countless hours with like-minded people, further narrowing their breadth of exposure to (the lack of) differing viewpoints and perspectives. This is one of the foundational principles I teach my clients as a business coach, advisor and mentor. I challenge people to think, evaluate and analyse problems and situations differently. My process, methodology and framework will be presented at my upcoming event “Etch-A-Sketch Thinking In The iPad Age“. If you want to learn how to learn, think and reason in this quickly changing world, attend the event. The strategies are so good, I actually back them up with a $5,000 results-based guarantee. This blog does a great job introducing you to ideas and concepts, but it’s superficial, just an overview. That’s the problem today. People wrongly consider information as intelligence and knowledge. Information is just bits and bytes of data. Intellect and knowledge is the ability to do something with that information. It’s what engineers do when they problem solve. It’s what lawyers do when they interpret the law. It’s what physicians do when they diagnose illness. It takes time, skill and a PROCESS. Otherwise you’re just “surfing the web” thinking you can build your own house, defend your own case and cure your disease. The solution is right between your ears. The question is will you do anything about it? “You never get a second chance…” or do you? We’ve all heard the expression “You never get a second chance to make a first impression…” It’s a powerful dictum. So much so that it resonates the reality that second chances are indeed rare. That’s why the FINAL ENCORE PERFORMANCE of The Exponential Extravaganza is so special. What’s even more special are the Internet-based announcements I’ve revealed at the event. For example, I am going to stop all my Internet Marketing Events with the 2010 Internet Marketing Bootcamp being the last one I ever stage. Yep, that’s right. I am leaving the spruiker infested waters that are overflowing with the Internet get rich quick schemers who want to turn you into the next information product millionaire making money in your underpants or while you sleep! I am totally over it – not the Internet – the spruiker speakers. I just can’t be even remotely associated with that kind of misrepresentation and amoral behaviour. BUT THAT DOESN”T MEAN I AM ABANDONING THE INTERNET – quite the contrary! I am going full steam ahead with the strategies that the top 5% of businesses use to make the most of their online sales channels, generating profits and revenues that out-perform the other 95% combined. That means doing things that no-one else is doing. I call it being antimimeticisomorphic. Doing out-of-the-ordinary things that create extra-ordinary results. Out of the ordinary things like NOT doing any more Internet Marketing events – keeping all the Exponential Strategies SECRET for my most elite Platinum Program Members – real businesses who leverage the Internet to get real people to buy from them. A tradie launch his firs twebsite, become a world-class blogger in less than a year, get on National TV because of it and increase sales 25% while competitors are downsizing? A consumer-based service company in a small town compete against a NATIONAL competitor with a $250,000 NATIONAL ad budget with a measly $20,000 web strategy? A start up be turning every $1 in Google Adwords into $50 of sales within the first 3 months of getting started? Another startup be creating a fully virtual company out of thin air, matching a $100 million/year competitor blow-for-blow with twice the sales conversion ratio and less than 1/10th the staff? A consultant who was building a business no-one would ever buy into a virtual sales system that generates 4 times the sales and could be sold for upwards of $500,000 in less than 24 months? A technical service based company that would have gone to the wall if it had not been for the Internet Strategies deployed in the nick of time, now those strategies are landing BIG corporate contracts his tiny competitors can’t even bid on!?!?! All of these entrepreneurs and businesses got a second chance with the Internet. Your second chance is to attend The Exponential Extravaganza – especially if you have not seen me speak in the last 2 years. What we’re doing now on the Internet has progressed so much that you might fall off your chair when I reveal some of the things we’ve been doing. But this is it – the FINAL ENCORE and only in Sydney. Do whatever it takes to get there. Making Money While You Sleep… Bul_ _ _ _ _! Published on June 1, 2010 in Events. 0 Comments Tags: Exponential Extravaganza. Spruikers – when they smell an opportunity – they jump on it like flies on _ _ _ _! That’s the problem with the Internet – it IS Exponential, but only 5% of us make any money with it. The other 95% don’t. The 95% are chasing a dream, the rainbow with the pot of Gold that never materialises. That’s one of the many reasons I no longer speak at FREE public multi-speaker events. The manipulative sales tactics used are horrendous and frankly disgust me. I remember the last time I stood on the same stage as some of these people – I had to go to my hotel room that night and take a long shower, that’s how slimy it felt. YUCCH! I stepped off the stage and vowed to never do it again. And I haven’t. That was almost 2 years ago. You’ll never hear those two words together on the multi-speaker stage! You’ll hear money back guarantee shouted from stage – good thing too because often, more than half the orders in the back of the room are refunded! So when I did step off the multi-speaker stage , there were quite a few of my own suspects and prospects who intended to come see me… eventually. Well, that time is now. OR NEVER. I am not planning any other events like the Exponential Extravaganza. Frankly, it’s just too much trouble for what it’s worth. I’m financially independent and don’t have to do this hard anymore. I’m opting for more direct approaches with WINNERS and HIGH ACHIEVERS who will find me via my multiple Pathways To Profits™. So that’s what the situation is – I decided to give you, as my blog reader and/or subscriber, one last chance to come and test drive Exponential Mindset Strategies – at my cost. Then that’s it. The FREE ride is over. In fact, it may be over before it even starts. We are selling Premium Seats to the Exponential Extravaganza and if they fill up the room, there won’t be any FREE SEATS available – so you have a decision to make – reserve a FREE seat and hope there are seats available, or book in for $97 and make sure you get in. How would you like to SELL OUT a FREE EVENT?!?!? Come to the Exponential Extravaganza and I’ll show you how it’s done and how you can use the same strategies in YOUR BUSINESS or for your CAREER. Published on May 27, 2010 in Events and Exponential Mindset. 0 Comments Tags: Exponential Extravaganza. INTERNET MARKETERS: If you’re FRUSTRATED spending rather than making money on the Internet, you’re not alone. The fact is only 5% of people on the Internet make money, in fact they make more than the other 95% combined. The top 5% have figured out how to do it with strategies that you can use, right now. The Internet is the easiest thing that’s hard to do – Unless you know WHAT and HOW to do what works! Come learn the time-tested, proven techniques, tips, tactics, skills and strategies the top 5% use that you can customise and optimise on your website IMMEDIATELY. Be forewarned – these are NOT get rich quick in your underpants tactics – they work for plumbers, retailers and dentists. If you’re in a job you don’t really like, you’ll be shown easy-to-use strategies to determine whether or not you should quit your job and/or change your career. If you kind of like your job, but think you should get paid more, I will reveal 3 strategies you can use to get that raise or promotion you want. If you’re stressed out at work, I’ll show you 2 reasons why that happens with antidotes that you can take to relieve stress the next time it pops up! If you’re struggling financially, at the Exponential Extravaganza, I am going to reveal, for the first time in a FREE event (I share this with my top Platinum Members) how to start a business with no money down AND an $100,000 investment portfolio with less than $5,000. 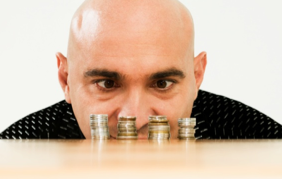 The strategies to be revealed are NOT get rich quick schemes (MLM). They are based on what the super rich are doing right now to build and protect their wealth. With all that said and done – go ahead and book into the Exponential Extravaganza. Bring your wife, husband, boyfriend or girlfriend with you. If you have ADULT children, bring them along as well as long as they’re adults – sorry, this event is not appropriate for children. If you have friendly colleagues you get along with, suggest they attend as well. I hope you’ll attend this one-off event. It would be a real shame for you to miss out, after all it’s the ONLY time I am doing this for FREE. Published on November 11, 2009 in Events and Internet Marketing. 0 Comments Tags: Dr Marc Dussault, Internet Bootcamp, Internet Marketing Strategies, Preview. I am in Melbourne on Monday night November 16 and back in Sydney on Tuesday night November 17 for the last series of previews for the 2009 Exponential Internet Marketing Bootcamp. Wondering if you should attend? Click the hyperlink to see the BONUS Google Adword MasterClass we’re staging. This is the a first-time ever reveal of how we create, deploy and test our Google Adwords campaigns… Consider it the secret to the vault! There is no other opportunity like this one to get started on the Internet – this 3-day Bootcamp is not a multi-speaker salesfest. It’s 100% value-packed with strategies, techniques and tips you can deploy on your website IMMEDIATELY. Click on the hyperlinks above to find out all the details. If that’s not obvious by now… enough said.